Sign-up through our E-list to receive a quarterly version of the NJTPA Update which includes key items from the previous few weeks. Automated vehicles will prompt a “seismic shift” in American society comparable to what occurred with the advent of the smart phone, says Mitchell Erickson, consultant and retired science advisor, U.S. Dept. of Homeland Security. Once in common use, they will forever alter our lifestyles and the physical layout of our communities, he predicts. Erickson offered his insights in a briefing to NJTPA staff titled “Mobility in 2050: Who Knows? How to Prepare for the Unknown” on March 30. He said there will be winners and losers in the transition to automated vehicles. Travelers will benefit from increased mobility options and dramatic increases in safety -- with traffic deaths reduced by as much as 90 percent. But many of those involved in our current car culture, including Uber and Lyft drivers, could lose their jobs. The pace of the deployment of automated vehicles will depend on companies’ ability to make them efficient, trusted, hackproof and accepted by consumers, he said. “There are huge uncertainties in our future.” he said. Transportation agencies such as the NJTPA must be “willing to plan for contingencies,” he advised. Declining demand for private automobiles, he predicted, could one day dramatically alter housing arrangements and land use, including eliminating the need for garages, roadside gas stations and much parking. In suburban areas, he said, as much of 20 percent of land area is used for parking. “What do we use all that space for?” he asked. Instead of offering free parking or coupons to draw customers, he envisioned, retail outlets, could offer automated vehicle trips to and from people’s homes. If deployed efficiently, the vehicles could help reduce greenhouse gas emissions, 26 percent of which currently come from the transportation sector. At the same time, he said, his background in Homeland Security made him aware of potential threats such as use of automated vehicles, drones and other systems for terrorist or criminal activities. He said while change is coming to the transportation sector “big time,” transportation agencies like the NJTPA have a “chance to shape that future” through current plans and programs. A growing number of cities and towns are using “green infrastructure,” employing landscaping and natural materials, to replace or supplement “gray infrastructure,” composed of pipes and concrete, to manage stormwater and prevent flooding. It was the focus of February 6 Together North Jersey Training Institute workshop at the NJTPA. With over 100 people in attendance, Bill Cesanek, Vice President, CDM Smith, gave an overview of the topic and introduced speakers who discussed how green infrastructure is being implemented in Philadelphia, New York City, Hoboken and Newark. Green infrastructure “mimics the natural storm water cycle,” Cesanek said. Water running off from pavement and other impervious surfaces is slowed down or stored to allow it to gradually infiltrate back into the soil. Without this cycle, runoff can accumulate into damaging floods or overwhelm combined water and sewer systems, causing harmful outflows into streams or rivers. Among the techniques used in green infrastructure are specially designed tree planters; landscaped medians, bumpouts or other areas along streets; permeable paving materials; rain gardens; green roofs on buildings; and subsurface storage systems. Among the benefits beyond reducing flooding, are supporting livability, natural habitats, public health and sustainable redevelopment. He said New Jersey was “coming into its own” in encouraging the use of the systems, with new legislation in Trenton, new regulations by state agencies and innovations by many municipalities. NJ Future has a guide and toolkit on its website to assist these efforts, he noted. Philadelphia is well along in its implementation of green infrastructure, said Elizabeth Svekla, Planning Manager of the Green Stormwater Infrastructure Unit in the city’s Water Department. A plan adopted eight years ago set a goal of creating 10,000 greened acres citywide in 25 years. The city, she said, has “hundreds of projects and thousands of acres” underway or in place. She said that, especially in urban areas, each location must undergo detailed analysis and evaluation, noting that “micro-typologies” can affect waterflows and make them hard to predict. ​New York City similarly is making great strides, said Vincent Lee, Associate Principal at Arup. The city in 2010 created a green infrastructure plan. It includes a goal of capturing rainfall from 10 percent of impervious surfaces in areas served by combined water-sewer systems. He said in addition to borings and other investigations of suitable locations, communities have to be consulted in an effort to balance the infrastructure with other uses of space including parking, building access, subways and more. In Hoboken, the city’s green infrastructure efforts gained new urgency in the aftermath of Superstorm Sandy, which inflicted heavy flooding and damage, said Jennifer Gonzalez, the city’s Director of Environmental Services and Chief Sustainability Officer. Seventy percent of the city is in the floodplain. Among the city’s responses are a Rebuild by Design program that includes plans for 61 rainwater storage systems to be installed as part of watermain replacements and rain water gardens in city parks. In Newark, the city is taking creative approaches to fund and implement green infrastructure, said Robert Thomas, Chief of Energy and Environment in the City Department of Engineering. Along Ferry Street and other locations, funding for transportation projects such as signal replacements or pedestrian improvements, he said, are being leveraged to help implement green storm water improvements. He also emphasized the value of gaining support from partners including foundations and businesses. Recently, the City has partnered with the New Jersey Institute of Technologies as part of Smart City initiatives. Presentations will be available on the Together North Jersey website. Full video of the event is available at https://youtu.be/X_zW8_nOBwA. Union County Freeholder Angel Estrada, NJTPA Chair, kicked off the Board’s first meeting of 2019 on Monday by welcoming new members and reflecting on all that was accomplished in 2018. Freeholder Estrada welcomed Somerset County Freeholder Director Brian Levine, the county’s new representative on the Board of Trustees, and Hudson County’s new Board alternate, transportation planner Byron Nicholas. He also thanked Lou Venech, of the Port Authority, for his many years of service as he prepares to retire. Steve Brown will replace Venech as the agency’s representative on the Board. The NJTPA had a busy year in 2018, including a federal certification review, he said. Representatives from the Federal Highway Administration and Federal Transit Administration met with staff and Board members over three days in November to discuss how the NJTPA conducts its metropolitan planning work. The federal agencies commended the NJTPA on its work in several areas, including performance-based planning, public engagement, freight planning and coordination with neighboring metropolitan planning organizations, Freeholder Estrada said. “We look forward to receiving the final certification report and of course will work quickly and efficiently to address any concerns raised,” he said. In 2018, the NJTPA also developed a guidebook to help municipalities and counties prepare for alternate fuel vehicles; continued expanding the Street Smart NJ pedestrian safety campaign in an effort to reduce pedestrian fatalities and crashes across the region; adopted a new Public Engagement Plan, which emphasizes reaching traditionally underserved populations; and completed a study that details a vision for a 111-mile continuous greenway closely aligned with the route of the historic Morris Canal. Work on the Morris Canal trail is already underway in many areas. Late last year, the state’s Regional Transportation Alternatives Program projects approved $11.1 million for four Morris Canal Greenway projects in Jersey City, Passaic County, Sussex County, and Warren County. The Metropolitan Area Planning (MAP) Forum, a consortium of nine metropolitan planning organizations (MPOs) from New York, New Jersey, Connecticut and Pennsylvania, met Dec. 6 to discuss common issues and concerns, and proposed projects affecting the region. He noted that during the NJTPA’s recent federal certification review, the U.S. Department of Transportation representatives recognized the MAP Forum’s effectiveness. “This strong validation from our federal funding agencies gives us renewed energy and an even stronger sense of purpose as we continue our collaborative work together,” he said. This includes the advancement of trans-Hudson improvements, which has become “a pressing safety and security issue that must be addressed,” he said. The meeting included a discussion of a work program to guide the forum over the coming year, followed by presentations and discussions of multi-state activities in three areas. First, Gerry Bogacz, New York Metropolitan Transportation Council, highlighted the activities of the Multi-State Freight Working Group, which has been focusing on the integration of freight and land use development, as well as changes in freight patterns due to growing e-commerce. Next, Rick Cippoletti, NJTPA, spoke about MPO coordination in preparing for transformative technologies such as greater numbers of electric vehicles and the prospect of automated vehicles. He also highlighted MPO coordination in preparing federally required performance measures and improvements in transportation modeling. There was also a discussion on resiliency. Jeff Perlman, NJTPA, addressed efforts to implement the findings of the federally sponsored multi-state study of impacts of Hurricane Sandy and other storms. The NJTPA, he said, is coordinating a resiliency study of the Passaic River Basin, which includes participation by New York representatives. The meeting also included presentations on sustainability, including the results of federal sustainable communities grants in New York-Connecticut and in North Jersey. Shawn Brede, New York Department of City Planning, discussed efforts to build upon the New York-Connecticut sustainability plan by fostering transit-oriented development around four proposed new Metro North rail stations in the Bronx. Miriam Salerno, Voorhees Transportation Center at Rutgers University, discussed the ongoing technical assistance provided by the Together North Jersey consortium, which was created with support from the federal grant. Becky Bradley, Lehigh Valley Planning Commission, addressed sustainability programs in Lehigh Valley. The next meeting of the MAP Forum in planned for the spring. Streets are routinely redesigned to improve the safety of drivers, people walking and cyclists. But what about using designs to improve safety by reducing crime? Good lighting, landscaping, well-designed sidewalks and public spaces can all make a community feel safer, according to a panel of speakers at the Together North Jersey Institute’s last workshop on Crime Prevention Through Environmental Design (CPTED). CPTED brings together different stakeholders — residents, business owners, law enforcement, planners and engineers — to consider how an area’s physical features can be improved to deter crime. Trimming trees along a street so that it’s easier to see suspicious activity, is one small step a community can take to encourage natural surveillance, which can improve safety, said Ifeoma Ebo, of the New York City Office of Criminal Justice. Another step is creating well-maintained public spaces that will attract more people and to consider using cameras to deter criminal activity. “The more eyes that you have observing the more cameras you have observing the less opportunity there is for crime to occur,” she said. She also said that CPTED can help build important relationships, but bringing together community members and local law enforcement to tackle problems together. Ebo and several other speakers said that in order for CPTED to be successful it must start at the community level, rather than a local government or organization coming in and telling the community to change. Getting community members involved in the projects also encourages them to take ownership of the redesigned spaces, said Dave Lustberg, of Arterial Consultants, who developed a CPTED plan for the City of Paterson. Pamela Daniels of the United Vailsburg Services Organization spoke about a CPTED effort on Pine Grove Terrace in Newark. There is an alley behind the homes on Pine Grove Terrace and Alexander Street, known as The Lane or Alexander Alley, which has become a dumping ground for trash and a place where crime occurs. Residents suggested splitting the property up and adding it to the adjoining lots, however that area has a high number of vacant and abandoned properties, Daniels said. So the group worked with graduate students at the Bloustein School of Planning and Public Policy at Rutgers and came up with two other concepts. One would create a bike lane and tie in a local bike shop to teach people about maintenance and repairs. Another would transform the alley into a public meeting space with a community garden and a café. The students also proposed plans for improving Pine Grove Avenue, which is wide for a one-way street and has some safety concerns. Daniels said the group is now working to build support for one of the options and raise funds to make it a reality. In the spring they will conduct a demonstration project, which includes temporarily bumping out the curbs, to slow traffic and show the community what potential safety improvements could look like. They are also planning a farm-to-table community dinner in The Lane so that people can envision the space’s potential. Mark Jehnke, Ocean County’s Supervising Engineer, and Barkha Patel, a Senior Planner in Jersey City’s Division of City Planning, were elected chair and vice chair, respectively, of the NJTPA’s Regional Transportation Advisory Committee (RTAC) on December 3. Jehnke most recently served as the committee’s vice chair. He takes the helm from Liza Betz, Transportation Planning Manager in Union County’s Department of Economic Development, who served as chair for two years. Both Jehnke and Patel were elected to two-year terms. The RTAC is comprised of technical staff from each of the NJTPA’s 15 subregions — the 13 counties in northern and central New Jersey and the cities of Jersey City and Newark — as well as representatives from NJ TRANSIT, the New Jersey Department of Transportation and the Port Authority. The committee honored Betz with a resolution thanking her for her service as chair, praising her for improving and enhancing subregional participation in the transportation planning process. One Cool Thing - Morris Canal Greenway - In the third installment of our One Cool Thing video blog we talk about the recently completed Morris Canal Greenway Corridor Study, which envisions a 111-mile trail from the Delaware Water Gap in Warren County to the Hudson River in Jersey City. The NJTPA Board of Trustees adopted an updated Public Engagement Plan at its November 19 meeting. The plan describes the different ways the NJTPA promotes participation by all members of the public who are interested in the agency’s activities to improve regional transportation. The plan describes the NJTPA’s goals and objectives for public engagement and also identifies specific approaches, techniques and opportunities for ongoing communication and interaction with the public. This plan outlines several new approaches to public outreaching including the establishment of a Public Engagement Advisory Committee; the creation of a committee to get more and better participation from young adults; and a Public Outreach and Engagement Liaisons pilot program aimed at better serving under-represented populations. Guidance on public participation for staff of partner agencies or consultants working on NJTPA-sponsored projects and programs. The full plan is available at htttp://njtpa.org/PEP. The NJTPA has a new executive director. The NJTPA Board of Trustees voted unanimously to appoint Mary D. Ameen, the agency’s deputy executive director, to the top post at its September meeting. Ms. Ameen has worked for the NJTPA since 2006. She most recently served as Deputy Executive Director, a position she was appointed to in 2012. Prior to that she was the Director of External Affairs. Before joining the NJTPA, Ms. Ameen was the Director of Strategic Transportation Policy and Planning at the New Jersey Turnpike Authority from 2003 to 2005. Prior to that she spent more than 20 years at the New Jersey Highway Authority, which was responsible for operating the Garden State Parkway until its consolidation with the New Jersey Turnpike Authority in 2003. She served as Assistant Chief Engineer, Assistant Chief Engineer for Construction and as a Traffic Engineer during her time there. Ms. Ameen holds a Juris Doctor from Rutgers Law School in Newark; a master’s in management from Stevens Institute of Technology, a master’s in civil engineering from the New Jersey Institute of Technology, and a bachelor’s degree in mechanical engineering from Stevens. Ms. Ameen also serves on the Intelligent Transportation Society of New Jersey’s Board of Trustees. She replaces Mary K. Murphy, who left earlier this year to take a position at the Port Authority of New York and New Jersey. The NJTPA is looking to better involve the region's residents in its programs, projects and plans. A new draft Public Engagement Plan (PEP) outlines the agency’s goals for public engagement and identifies specific techniques and opportunities for ongoing interaction with the public. The draft plan, available at www.njtpa.org/PEP, is undergoing a formal public comment period through November 2, 2018. Public comments can be submitted to pep@njtpa.org. A public meeting on the draft PEP will be held on Thursday October 11, 2018 from 5 to 7 p.m. (with a short presentation at 6:00 p.m.) at NJTPA offices in Newark. The PEP is the latest update of the NJTPA's public participation plans. It’s the product of extensive research into public participation best practices, as well as the agency's first-hand experience from its own innovative and award-winning outreach efforts for Plan 2045: Connecting North Jersey. Some new opportunities for engagement in the plan include: the proposed establishment of a Public Engagement Advisory Committee; the establishment of a young adult advisory committee; strategies to better include under-represented populations in decision-making; and guidance for developing future public participation plans for NJTPA-sponsored programs and projects. Jersey City used demonstration projects during a recent study to show community members what pedestrian improvements, including corner extensions, could look like at six intersections. The NJTPA has awarded complete streets technical assistance to nine municipalities in North Jersey. Work will include walkability workshops, a bicycle network audit and low-cost temporary changes, called tactical urbanism, to demonstrate what improvements — such as corner extensions — could look like. Complete streets are roads that are designed to be accessible to all users and all ability levels. The NJTPA is funding the assistance — up to $10,000 for each municipality — which is being provided by Sustainable Jersey and the Alan M. Voorhees Transportation Center at Rutgers, the State University of New Jersey. In addition to the technical assistance, the NJTPA, in partnership with Sustainable Jersey and the Voorhees Transportation Center, has already conducted three workshops for municipalities on implementing complete streets at the local level. Three municipalities recently completed vision plans that aim to bolster their downtowns through transit-supportive development and policies. The planning initiatives in the Town of Boonton, Morris County; Borough of Freehold, Monmouth County; and Town of Green Brook, Somerset County, were completed as part of the NJTPA’s Planning for Emerging Centers Program. The program provides technical assistance to municipalities wanting to create more sustainable, transit-supportive and walkable communities. All of the reports are available on the Planning for Emerging Centers page. Both Boonton and Freehold developed their plans with a focus on achieving Transit Village designation from the New Jersey Department of Transportation. The state’s Transit Village Initiative creates incentives for municipalities to revitalize or redevelop mixed-use areas around transit stations. A limited number of designations are awarded each year, but once a municipality successfully applies to the program it can receive technical assistance and priority funding from some state agencies. Boonton’s plan focuses on enhancing the area around the train station and includes pedestrian safety improvements, changes to parking, new public spaces and increased housing choices. Freehold’s plan focuses on the area around the Freehold Center Bus Station and includes comprehensive redevelopment plans for two areas in the downtown, the Transit Gateway Area and Courthouse Square Area. Green Brook’s plan focuses on amending the zoning of the Township’s Village Commercial District to facilitate development. The plan splits the Village Center into three districts: the Village Commercial District provides a concentration of improvements to commercial and mixed-use properties, as well as public spaces; the Village Gateway District better connects pedestrians and transit users from Route 22 to the Commercial District; and the Residential/Office District preserves the historic residential character while permitting more small scale office uses near the Commercial District. As part of this program, the NJTPA recently launched a study with Hoboken to develop a Complete Streets Design and Implementation Plan, which would update the city’s five-year old complete streets policy. This study is scheduled to be completed next year. The NJTPA recently completed the Morris Canal Greenway Corridor Study, which identifies the route for a continuous 111-mile pedestrian and bicycle trail from the Delaware River in Warren County to the Hudson River in Hudson County. The study, which is available at MorrisCanalGreenway.org, identifies 38 miles of existing trails and recommends 76 projects that would connect municipalities in six counties, stretching from Phillipsburg to Jersey City once completed. The greenway would follow the route of the historic canal as closely as possible, though some deviations are necessary to get around developments and major roadways. While several counties have conducted Morris Canal studies in the past, this is the first to provide a comprehensive region-wide plan for the full greenway. The Morris Canal was built from 1825 to 1831 to transport Pennsylvania coal to markets in New Jersey and New York. Known as the “Mountain Climbing Canal,” it overcame an elevation change of 1,674 feet over the entire northern part of New Jersey through a system of 23 lift locks and 23 inclined planes, which allowed boats to be raised or lowered up to 100 feet at a time. This feature alone makes the Morris Canal a national engineering marvel. The study identifies short- and medium-term projects that could be completed within 10 years, ranging from signage installation and improvements to existing paths, to construction of new trail. There are also long-term projects, which could require property acquisition or significant construction, like installation of a bridge. Some of the projects identified in the plan already have funding secured, but others would be completed as additional resources become available. The study identifies temporary trail connections, using roadways or publicly owned land, to get around segments that will take longer and be more challenging to implement. The study also includes design recommendations for urban, rural and suburban areas that recognize the unique landscape the canal traverses while ensuring the various segments are recognized as a connected corridor. It also recommends that a non-profit be formed to oversee the completion of the greenway and its maintenance in the future. A study undertaken by NJ TRANSIT in partnership with NJTPA investigated how to improve bicycle and pedestrian access to transit stations. The study final report has just been posted on the NJTPA website. The study examined barriers to access and safety for bicyclists, pedestrians, and people with disabilities at a bus station in Irvington, Essex County; and rail stations in Madison, Morris County; Red Bank, Monmouth County; Rutherford, Bergen County; Summit, Union County; and Woodbridge, Middlesex County. In each community, the study team conducted research and data analysis and gathered input from meetings of a technical advisory committee, discussions with municipal officials, site visits and field observations and public information sessions. The final report includes separate sections on each municipality. The design concepts recommended by the study focused on low-cost solutions such as crosswalk designs, curb ramps, on-street bicycle accommodations, bicycle parking, curb extensions, intersection markings, lighting and Rectangular Rapid Flash Beacons, signs with flashing lights, which pedestrians can activate by pushing a button, to alert drivers before crossing. The study said many of these concepts could be deployed as “tactical urbanism” projects, which are design changes implemented to street environments in a “light, quick, cheap,” and temporary manner. By showing roadway users – pedestrians, bicyclists, drivers – the design changes in real space, this approach provides an opportunity to build significant community support before making large investments in infrastructure. NJ Transit issued a statement saying that the study “is a demonstration of NJ TRANSIT’s commitment to safe and accessible transportation…NJ TRANSIT would like to thank the NJTPA and the six host communities that participated in this study.” NJ TRANSIT also noted that the study was a pilot effort that could eventually lead to similar work being done at other transit sites. The NJTPA has updated the Freight Activity Locator tool to include the latest information on truck parking facilities in our 13-county region. The map includes public lots, private independently owned properties and national chains and the number of parking spaces available at each facility. There are 1,226 truck parking spaces at facilities in the region. This data can help planners, engineers, municipalities, counties, state officials and the private sector better understand where there is a need for additional truck parking in the region. Truck parking is critical to goods movement in New Jersey and across the United States. Increased truck traffic and restrictions on the number of hours drivers can be on the road are increasing demand and exacerbating the nationwide truck parking shortage. New Jersey is one of 18 states that reported the most severe parking shortages, according to a 2015 federal survey, and the State of New Jersey Freight Plan identifies the need to ensure sufficient and safe truck parking as a critical issue. This truck parking map serves as a first step in inventorying New Jersey’s available truck parking and determining how to provide sufficient capacity. This information has been shared with New Jersey Department of Transportation for inclusion in its statewide database. The NJTPA will next look at utilization rates for these lots. To access the information, visit http://freightactivitylocator.njtpa.org/ and click on the Truck Parking tab. A PDF map of truck parking is also available. From quick temporary changes to roads, to finding funding for more permanent improvements to running a public education campaign, the latest Together North Jersey Institute workshop covered the various ways communities can work to improve pedestrian safety. The half-day workshop also touched on the ways crime can impact walking in low-income and minority communities and offered an overview of national movements aimed at reducing pedestrian fatalities. Pam Shadel Fischer, a transportation safety consultant and former director of the New Jersey Division of Highway Traffic Safety, said the Vision Zero movement, Toward Zero Deaths initiatives and Road to Zero coalition may have slightly different approaches and timeframes but they’re all working toward the same overarching goal — reaching zero roadway fatalities. But getting to that number will take work, she said, and it means getting people to change their own behaviors and encouraging others to follow their example. “We can do this, but we have to recognize everybody has a right to the road, but with that right comes a responsibility,” she said. Charles Brown, senior research specialist at the Alan M. Voorhees Transportation Center at Rutgers University, said that communities need to examine crime data when they’re considering ways to improve pedestrian safety. He said people walk where they feel safest in terms of crime, but that route may not be the safest for pedestrian travel. Bettina Zimny, Director of Planning at NV5, Inc., gave an overview of complete streets projects, which are roadways designed for all users. She said while it can be difficult to convince local officials of the need to invest in large projects, highlighting the many benefits is one way to get support. “The economic value alone of improving places for walking is huge,” she said. Leigh Ann Von Hagen, senior research specialist at the Alan M. Voorhees Transportation Center at Rutgers University, gave an overview of different funding opportunities for pedestrian-related projects, including the Transportation Alternative Program, which can be used for trail projects, and Safe Routes to School grants, which can fund improvements to help students get to and from school safely. NJDOT is accepting applications for both programs through August 24. Communities can also use Safe Routes to School Programs to educate students about safe walking and bicycling practices, said Lisa Lee, Manager of Bike and Pedestrian Programs at EZ Ride Transportation Management Association (TMA). The TMAs give students helmets, offer safe skills bike courses, conduct crosswalk demonstrations to show children how to safely cross the street and support Street Smart NJ, the NJTPA’s statewide pedestrian safety campaign. Will Yarzab, the Street Smart NJ coordinator, explained to attendees how to participate in Street Smart NJ, from hosting a planning meeting, to attracting volunteers, conducting education and enforcement and evaluating a campaign’s effectiveness. Laura Torchio, deputy director of transportation initiatives at Project for Public Spaces, and Barkha Patel, senior transportation planner for the City of Jersey City, both spoke about how implementing temporary projects can help lead to more permanent changes. Torchio encouraged attendees to “test before you invest” to see if a proposed bike lane or curb extension works best for the street the community is trying to improve. “If your community doesn’t like it, it’s easy to undo because you’re not moving curbs, you’re just using paint,” she said. Jersey City did just that as part of its Jersey City Pedestrian Enhancement Plan, called JC Walks, part of the NJTPA’s Subregional Studies Program. Patel said that by using temporary paint, planters and colorful tape, the city was able to demonstrate to the community what improvements to their neighborhoods could look like. Before the demonstration projects people told her that there was no way the concepts would work, but after seeing them they wanted the city to narrow the crossing distance for pedestrians and create more pedestrian seating, among other things. Culvert replacements and bridge work are among the county and municipal projects now eligible for low interest loans through the New Jersey Transportation Infrastructure Bank or I-Bank. The funding is available through a partnership between the New Jersey Department of Transportation (NJDOT) and I-Bank an independent state financing authority. David Zimmer, Executive Director of the I-Bank, gave a presentation on the new transportation funding options during the NJTPA Board meeting July 9. His presentation slides are available here. Since 1985, he said, New Jersey has had an infrastructure bank to fund drinking and wastewater projects. It has invested $7.2 billion in water projects, saving borrowers $2.4 billion in interest payments, Zimmer said. In 2016, the same financing model was applied to transportation projects by creating the I-Bank. With approval of the State Legislature, NJDOT’s Local Aid Infrastructure Fund allocated $22.6 million each year to I-Bank. This funding has been further leveraged through bonding to provide $39 million each year in spending power for projects. The I-bank currently has on hand nearly $80 for low interest loans. The funding takes the form of short term loans of up to three years to cover design, engineering and construction. Once the project is complete, the short term loan is converted into a long term loan over the useful life of the project (up to 31 years). The loans are generally repaid through county or municipal budgets. In addition to offering low interest rates (about 1.5 percent), Zimmer said the I-Bank also only charges interest on the money a municipality or county has borrowed as it is drawn down, rather than charging interest on the full loan amount when it is approved. NJTPA Chairman Angel Estrada said the I-Bank was potentially very valuable, “presenting the opportunity for counties and municipalities to do projects on their own” without the complications and delays of depending directly on federal or state resources. Visit the New Jersey Transportation Infrastructure Bank’s website to learn more. The NJTPA is working with Sustainable Jersey, the Voorhees Transportation Center and Rutgers University and Together North Jersey to offer free training and technical assistance to local officials, staff and the public to support the implementation of complete streets at the municipal level. Free workshops on implementing complete streets at the local level are being held June 26 at the NJTPA and on June 27 at the Edward J. Bloustein School of Planning at Public Policy at Rutgers University’s New Brunswick campus. Complete streets are designed with all users in mind — pedestrians, cyclists, vehicles and public transportation — and for people of all ages and abilities. In addition to the workshops, staff from Sustainable Jersey and the Voorhees Transportation Center will provide free technical assistance to nine municipalities to complete a specific project related to advancing a complete streets initiative. This is a competitive program open to municipalities in the NJTPA’s 13-county region (Bergen, Essex, Hudson, Hunterdon, Middlesex, Monmouth, Morris, Ocean, Passaic, Somerset, Sussex, Union and Warren counties). The value of the technical assistance will generally not exceed $10,000. Examples of eligible projects include walkability workshops; bicycle audits and network plans; complete streets marketing and promotional materials; and guidance on integrating trucks and parcel deliveries into existing complete streets plans. Additional details are available in the Application Information Packet. An informational webinar about the Technical Assistance Program is being held June 20. Click here to register. The deadline to apply is July 27. To learn more about complete streets, check out our last issue of InTransition magazine. New Jersey Future will honor Passaic County, the NJTPA and WSP, the consultant on the project, with a Smart Growth Award for the Great Falls Circulation Study during an award ceremony in Newark on June 6. The study provides an analysis of opportunities for redevelopment, improved circulation, enhanced pedestrian mobility and expanded access to Great Falls National Historic Park in Paterson. It was funded through the NJTPA’s Subregional Studies Program. A pdf of the study is available here. The Great Falls Circulation Study is among seven winners this year. Other projects include an indoor urban agriculture project, repurposing of industrial buildings and green stormwater and resiliency work. The awards celebration is being held at the historic Great Hall at Rutgers University-Newark on June 6 from 5:30 to 8 p.m.
“Redevelopment has become increasingly the norm for how New Jersey will accommodate its growth, and demand for our older, already-built places continues to rise,” Olivia Glenn, south Jersey metro regional manager for the New Jersey Conservation Foundation and chairwoman of this year’s Smart Growth Awards jury, said in a news release. NJTPA Chair Angel Estrada, NJTPA Acting Executive Director Mary Ameen and Central Staff joined Acting NJ Department of Transportation Commissioner Diane Gutierrez-Scaccetti for a tour of Conrail’s operations in North Jersey on May 9. Port Reading Junction improvements and the Bergen Tunnel Clearance project, which are part of The Liberty Corridor, a series of multi-modal transportation projects that were funded by Congress in 2005. The addition of a second track to the Passaic & Harsimus (P&H) Line in Kearny, using remaining Liberty Corridor funds. Construction of a ship-to-rail intermodal container transfer facility (ICTF) and Greenville Yard in Jersey City. This project received about $80 million in federal earmarks and grants. The Cross Harbor car float operation in Greenville Yard, which received a federal Fixing America’s Surface Transportation (FAST) Act grant. The tour also highlighted several projects Conrail hopes to complete in the future, including replacement of the Point No Point Bridge over the Passaic River, which was built in 1901; the Waverly Loop project, which would allow trains to enter Oak Island Yard in Newark from the P&H Line without reversing into the yard; and adding a second track to the National Docks Branch from CP Green to Linden Avenue in Jersey City. Also on the trip were representatives from Senate President Stephen Sweeney’s Office, officials from Norfolk Southern and Conrail; Joseph Bertoni, Deputy Commissioner of NJDOT and Nicole Minutoli, Director of Multimodal Services at NJDOT. The Metropolitan Planning Area (MAP) Forum’s Multi-State Freight Working Group, a consortium of nine metropolitan planning organizations (MPOs) in the urbanized area spanning New York, New Jersey, Connecticut and Pennsylvania, met on April 3, 2018 in Newark to discuss common freight issues and concerns and proposed projects affecting the region. NJTPA Deputy Executive Director Mary D. Ameen and NJTPA Director of Freight Planning Anne Strauss-Wieder welcomed the 30 attendees to the working group’s second meeting. Strauss-Wieder highlighted the growing importance of freight management for the New Jersey region as a result of growing ecommerce and increasing demand for properties for warehousing and distribution operations, including smaller “last mile” facilities closer to consumers. Featured presentations at the forum were by Marygrace M. Parker, Dirctor of Freight & Innovation in Transportation at the I-95 Corridor Coalition and Becky A Bradley, Executive Director of the Leigh Valley Planning Commission. Parker focused on supply chain fluidity, which describes efforts to improve the end-to-end performance of freight supply chains, as goods flow across public and private infrastructure, various modes and many jurisdictions. The objective of the I-95 Corridor Coalition Freight Fluidity Program is to improve measurement of freight transportation performance in terms of time, reliability and cost. It is preparing to issue regular reports on supply chain performance focusing on a “market basket” of goods representing key freight sectors. Bradley discussed trends and issues related to freight in the Leigh Valley Planning Commission’s region, noting that warehousing activity and truck commodity flows have increased tremendously. Tonnage of goods moved could double by 2040, she said. In response, the region is undertaking major infrastructure projects such as widening of Route 22 over the coming decade. The private sector has helped finance key projects and is underwriting a “Point of Access Study” in one key freight and warehousing location with resident input. After the presentations, updates of freight planning activities was provided by members and attendees including from the Departments of Transportation, Metropolitan Planning Organizations and federal agencies. Further information about the MAP Forum is available on the NJTPA website. The next meeting is being planned for September 2018. The American Planning Association (APA) has honored the NJTPA and the Voorhees Transportation Center at Rutgers University with a Silver National Planning Achievement Award for Public Outreach for our innovate public outreach effort for our long-range plan, Plan 2045: Connecting North Jersey. Each year APA recognizes outstanding planning efforts and planning leadership with its National Planning Excellence and Achievements Awards. The NJTPA worked with the Voorhees Transportation Center to research outreach activities at planning organizations around the world and develop best practices. More than 400 public engagement activities have been compiled into a database tool, Engage! A Public Involvement Resource, which is available to the public. The NJTPA used some of the more innovative engagement activities to gather public input for Plan 2045, a federally-mandated long-range transportation plan that sets a vision for development of the transportation system and guides investments over the next 25 years. 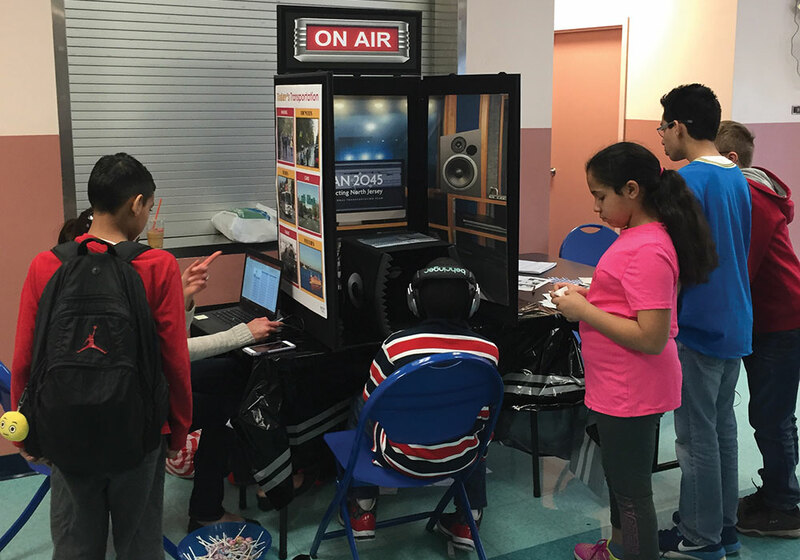 This specialized outreach included Set the Table, a dinner party program that engaged millennials; NJTPA On Air, a pop-up radio booth that allowed children to share their vision for the future of transportation (shown above); and workshops at ESL classes and with low-income residents. These specialized outreach efforts, coupled with traditional public meetings, an online survey and tabling at community events, allowed nearly 3,000 people to provide input as part of the Plan 2045 outreach. Union County Freeholder Angel Estrada pledged to continue expanding the NJTPA’s two safety programs and detailed other priorities during his first full meeting as Chair of the Board of Trustees. Estrada said the NJTPA’s Street Smart NJ pedestrian safety program and Local Safety Program provide a comprehensive approach to safety. He noted that many Local Safety Program projects incorporate pedestrian safety, including 11 projects totaling $46.6 million that the Board approved in January. “I want to assure all of you that the NJTPA’s commitment to safety will remain strong while I am chairman,” Freeholder Estrada said. Freeholder Estrada also highlighted the important role that transportation investment plays in bolstering the economy. He pointed to the job opportunities generated by trade and related activity at the Port of New York & New Jersey. He also pledged to focus on the environment, by prioritizing the truck replacement program at the port to reduce emissions and to support alternative fuel vehicles. Freeholder Estrada said equity would play a role in everything he does as NJTPA Chair. “As an immigrant to this country and the first Latino to hold the position of chairman at the NJTPA, I want to stress that we are here to serve all the residents of our region and to see that everyone benefits from our transportation system and all the opportunities it provides,” he said. During the meeting Freeholder Estrada also announced the new committee leadership for 2018-2019 and thanked the members for their dedication to the Board. Planning & Economic Development Committee: Passaic County Freeholder John W. Bartlett, NJTPA Second Vice-Chair, will serve as Committee Chair. Hunterdon County Freeholder Matthew Holt, NJTPA First Vice-Chair, will serve as Committee Vice-Chair. Project Prioritization Committee: Morris County Freeholder Kathryn DeFillippo, NJTPA Third Vice-Chair, will serve as Committee Chair. Essex County Executive Joseph DiVincenzo, NJTPA Board Secretary, will serve as Committee Vice-Chair. Freight Initiatives Committee: Middlesex County Freeholder Charles Kenny will serve as Committee Chair. Ocean County Freeholder John Kelly will serve as Committee Vice-Chair. The NJTPA has developed a guidebook to help municipalities prepare for and encourage increased use of alternative fuel vehicles. Use of the vehicles, particularly electric cars, is expected to grow dramatically in coming years. Along with vehicles powered by natural gas, biodiesel and other fuels, electric vehicles help reduce air pollution and greenhouse gases, improving the environment and public health, while providing economic benefits. To develop the guidebook, the NJTPA worked with three pilot communities — Montclair Township in Essex County, the Town of Secaucus in Hudson County and Woodbridge Township in Middlesex County — to develop local readiness plans. These plans help develop an understanding of the alternative fuel vehicle market in each community; identify stakeholders; identify barriers to increased alternative fuel vehicle usage; and develop action plans to help support alternative fuel vehicle market growth. The guidebook highlights best practices, offers insights into the different types of alternative fuels and includes recommendations for advancing alternative fuel vehicle usage. Among the issues municipalities face, are the need to accommodate electric charging stations on public streets and encourage their installation in new private development, including parking garages in apartment buildings. The guidebook contains information on zoning and parking regulations; permitting and inspection; stakeholder engagement; and targeted education and outreach. As of December 2017, 13,194 all-electric and plug-in hybrid electric vehicles have been purchased in the NJTPA region, with a large portion located in Bergen, Essex, Monmouth and Morris counties. There are nearly 200 electric vehicle charging stations in the NJTPA region. The NJTPA supports regional deployment of alternative fuel vehicles and related infrastructure in both the consumer and fleet markets. Increased use of alternative fuel vehicles supports domestic industries and promotes improved air quality and environmental sustainability. The guidebook, pilot community reports and a final report are available on the Alternative Fuel Vehicles page. The NJTPA Board of Trustees approved 13 grants totaling $50.8 million for pedestrian safety and road improvement projects across the region. The grants are part of the NJTPA’s Local Safety and High Risk Rural Roads programs, which fund cost-effective solutions that can make an immediate impact on their target areas. The funding will be used for traffic and pedestrian signal upgrades; high visibility crosswalks; pedestrian refuge islands; road diets, which reduce the number of travel lanes; high-friction surface treatments and more. The NJTPA established the programs in conjunction with the Federal Highway Administration and New Jersey Department of Transportation to advance safety initiatives on county and local roads. The Local Safety and High Risk Rural Roads programs utilize federal Highway Safety Improvement Program funds. The Board approved 13 Local Safety Program projects and one High Risk Rural Roads project in Monmouth at its January 22 meeting. Additional information on each of the projects is available here. Union County Freeholder Angel Estrada became the first Latino Chair of the NJTPA when he was elected at the Board of Trustees meeting today. “I am honored that the Board of Trustees has entrusted me with the position of Chair and I am eager to continue the great work of the NJTPA, and I’m honored to follow the footsteps of Freeholder Palmer, and I really sincerely mean that” Freeholder Estrada said. Freeholder Estrada noted that he came to the United States from Cuba as a refugee when he was 10 years old. Freeholder Estrada has been an NJTPA trustee since 2012 and served as a Board alternate before that. He has served as Chair of the NJTPA’s Project Prioritization Committee since 2016. He previously served as Chair of the Planning and Economic Development Committee in 2014. Executive Committee Members (from left to right): Hunterdon County Freeholder Matthew Holt, First Vice-Chair; Morris County Freeholder Kathryn DeFillippo, Third Vice-Chair; Passaic County Freeholder John Bartlett, Second Vice-Chair; Union County Freeholder Angel Estrada, Chair; Essex County Executive Joseph DiVincenzo, Secretary. In addition to Freeholder Estrada becoming Chair, the Board elected Hunterdon County Freeholder Matthew Holt First Vice-Chair; Passaic County Freeholder John Bartlett Second Vice-Chair; and Essex County Executive Joseph DiVincenzo Board Secretary. In accordance with the bylaws, Freeholder Estrada appointed Morris County Freeholder Kathryn A. DeFillippo to the position of Third Vice-Chair. The Executive Committee provides guidance and leadership to the full Board on a wide range of planning, policy and administrative issues. It meets as needed to review financial, personnel and policy matters. Board membership is an uncompensated position. The Board paid tribute to outgoing Chair Peter Palmer, a former Somerset County Freeholder who did not seek re-election last year. Palmer first joined the Board in 1999 and founded the Freight Initiatives Committee in 2002. He twice served as chairman, from 2004-2005 and from 2016-2017. “I wish all of my colleagues on the Board the best of luck going forward and I encourage the new administration in Trenton to see the NJTPA for what it is: A truly bipartisan body of elected officials and agency heads working closely together with a common goal in mind — to improve transportation across all modes so that everyone who lives, works and travels in our region can thrive,” he said.